If Gaja is treated – and dismissed – as a regional problem, we could witness more farmer suicides, agricultural land in the Cauvery delta turn into real estate and widespread labour migration. A few days ago, a video showing a group of people running behind a moving vehicle asking for food went viral on the social media. It had been shot in Tamil Nadu, in a village devastated by Cyclone Gaja. The impact of Gaja hasn’t been fully understood yet. The state government and regional media have only just started paying attention to the crises. Neither the Centre nor the national media seem to have noticed yet. According to the state government, Gaja has run through eight districts of Tamil Nadu. Of them, Nagapattinam, Thiruvarur and Thanjavur are the worst hit (in that order). And these three along with parts of Tiruchirappalli, Pudukkottai, Chidambaram and Cuddalore districts are together known famously as the Cauvery delta. This region was historically under Chola rule, and reputed for its paddy fields. Until the mid-20th century, the Cauvery used to be a perennial river in this area. That stopped being the case when a series of dams were constructed in its path from the 1960s. In the 1990s, farmers in Nagapattinam started moving away from paddy because the district was so far downstream and water had became hard to get. Many paddy farms were converted into coconut, mango and cashew groves. Today, Tamil Nadu ranks fifth among paddy-producing states in India; its paddy fields make up 30.77% of the state’s total cropped area. In spite of the growth of other crops, Nagapattinam still has the largest area under paddy (154,040 ha) followed by Thiruvarur (151,629 ha) and Thanjavur (150,228 ha). They’ve all been hit by Gaja. The major rice-growing seasons in these districts are kuruvai (May-August) and samba (August-February). Kuruvai coincides with the slimmer southwest monsoon and samba, with the more generous northeast. As a result, kuruvai banks on river-water irrigation, and there are many farmers who don’t sow crops in this season at all. Samba is the busier time of year. According to a 2017 study, Thanjavur farmers planted 109,799 ha of rice in the 2015-2016 samba season. And it was during samba – when almost every paddy field in the region was fully planted – that Gaja struck, flattening the crop. At least 100,000 ha of paddy crops is estimated to have been damaged in Thanjavur alone. The official data isn’t out yet. According to the Tamil Nadu Agricultural University, the yield rate in Thanjavur is typically 2,017 kg/ha per annum. Assuming the half-year yield is 1,000 kg/ha, the amount of paddy lost due to Gaja in this district alone could be 1 lakh tonnes. If Nagapattinam and Thiruvarur districts are included, the joint paddy loss could be almost 4 lakh tonnes. The total loss in the Cauvery delta is likely to be much more. And this is just for paddy. Tamil Nadu is the third-largest coconut-producing state in the country. According to an initial state government report, nearly a crore coconut trees have been damaged by Gaja. Each tree used to bear about 60 coconuts a year. That’s about 60 crore coconuts lost in the next five or so years. It takes around five years and 88,000 rupees to create a coconut grove over one acre. The earliest income is in the sixth year. Now, those whose groves have been damaged by Gaja must spend more to clear the land, replant and manage an additional five years. It is unclear how many farmers have the money and resilience to do this. Some 90% of Tamil Nadu’s farmers fall in the small and marginal categories. Agriculture is their only livelihood. Most of these farmers are frequently, if not constantly, in debt to private lenders, especially before the sowing season. Farmer suicides have become more common in the last 20 years, with the distribution of Cauvery water in dispute. In April 2017, Tamil Nadu recorded 30 farmers as having committed suicide in the state in 2016, in affidavit to the Supreme Court. Though this number is low compared to the scale of the tragedy in Maharashtra and Telangana, it represents a significant increase in the state’s history. In Gaja’s aftermath, this situation is only going to worsen. A cyclone is not like a famine. 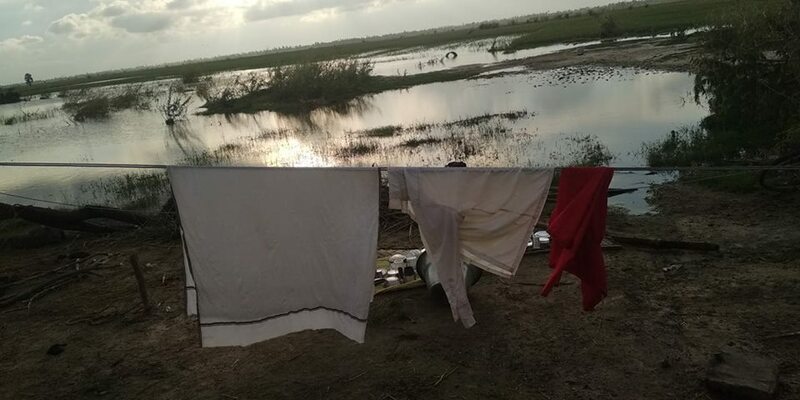 Both damage crops, but a cyclone also damages houses, cattle, other trees on the farm, the wells, borewells, canals and electrical equipment and personal belongings such as vehicles and household goods. Most of all, a cyclone damages the hope of better days. The farmers may have been able to cope with damaged crops alone but when ruin mars almost every aspect of their lives, government support is crucial to their survival. And that’s been missing. Small and marginal farmers mostly live in houses with thatched or tiled roofs. 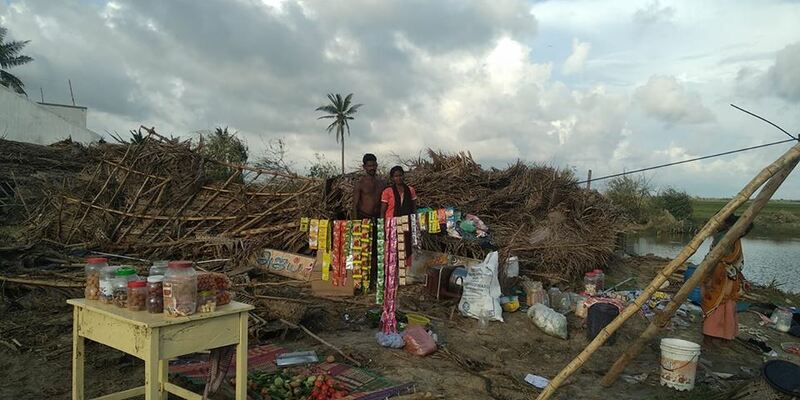 A ‘house damage survey’ reportedly conducted by the government found 100,000 houses damaged across 157 villages in four taluks of Nagapattinam. The data-taking is yet to be completed. The government plans to provide Rs 10,000 for fully damaged houses and Rs 4,000 for partly damaged houses. Obviously, this won’t be enough. Nagapattinam and Pudukottai are also coastal districts. 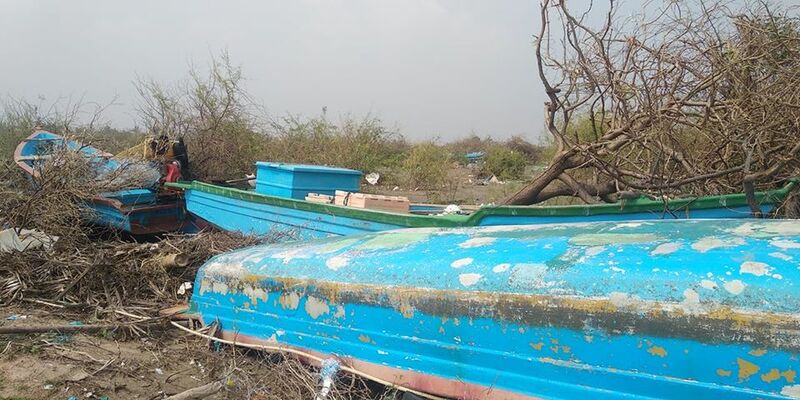 As Gaja dissipated, pieces of boats could be seen on the water all along the coast. That means lakhs of rupees in repairs. They’re not going to be seen sailing any time soon, and the fishing sector in the area will be turned off. Alas, the flotsam also included dead cattle and poultry, particularly in the Harichandra river in Vedaranyam taluk. When we visited the place again after 23 days, the corpses of dead cows, buffaloes and goats still lay around. The people there said they didn’t dispose of the animals because they wanted to show them to government officials and claim some relief. The carcasses were the only proof that they owned cattle. When Cyclone Vardah struck Chennai in late 2016, it was reported that 10,000 electric poles had fallen. It took a week or two to restore power in all areas in the city. Gaja hit eight districts, felling an almost uncountable number of electric poles. But over a month later, most of these areas languish in darkness. No one has any clue when power will be restored. Until then, agricultural activities can’t resume – nor can the various cottage industries in these parts, including weaving, veena-making, sculpting, etc. And ultimately, no work means no pay. Many of the people in these districts are now left with the clothes on their back, and heaps of mud, debris and slush where their homes once stood. These people are now refugees in their own land. With no shelter, many families can be seen living on the roadside or at bus-stations. Some have tarpaulin sheets for roofs, but when it rains, their living conditions are simply distressing. Government shelters were overcrowded (and have since been shut). In some places, the men have moved out to the streets so the women and children can stay indoors. Two weeks after the storm passed, schools had to be reopened, and government officials had asked the people living there to leave. When the people requested that they be allowed to only stay nights, the officials refused. Any house that survived has been turned into a camp and houses many families at once. The Cilappatikāram, one of the five great epics of classical Tamil literature, described the people of the Cauvery basin as those who produced enough food for their kingdom. Now, their own livelihoods have simply vanished and many people have been left to fend for food on their own. And this is what the viral video also captured. Like all crises, this one won’t end by simply reversing its latest consequence. It will end when their livelihoods are restored. 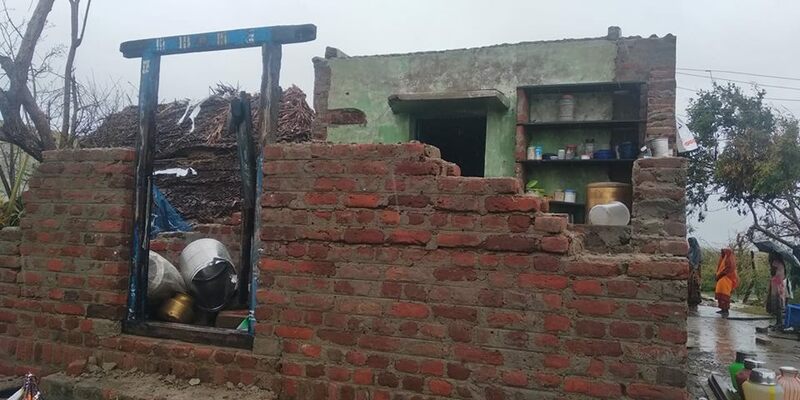 For this to happen, the nation – the Centre and national media included – should understand that Gaja is not a regional problem but a national disaster. If this doesn’t happen, we may just witness more farmer suicides, agricultural land in the Cauvery delta turn into real estate and widespread labour migration. All of these will hurt India.